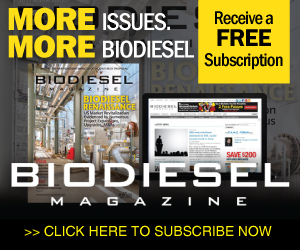 A proposal by Rep. Kevin Brady was released for a multiyear extension to keep the biodiesel tax credit at its current rate of $1 per gallon for 2018 through 2021 but gradually reduce it to 33 cents per gallon by 2024 and then allow it to expire. Following its acquisition of the 19 MMly Evoleum biodiesel plant in St-Jean-sur-Richelieu, Quebec, Innoltek Inc. has ceased operations at its 5 MMly biodiesel plant in Thetford Mines, Quebec, and has concentrated production in St-Jean-sur-Richelieu. The U.K. Department for Transport has published preliminary data on its Renewable Transport Fuel Obligation for a portion of 2018. Of the biofuel that has met sustainability criteria, 59 percent was biodiesel, followed by 38 percent ethanol. B100 produced by REG and purified with Cynersorb, a surface-functionalized diatomaceous earth from Imerys, helped skipper Phil Sharp take third place out of dozens of participants in this year's Route du Rhum yacht race in the Class40 category. The South Carolina Biomass Council held an award ceremony Nov. 15 on the grounds of its 2018 Biomass Project of the Year Award recipient, Green Energy Biofuel, in Warrenville. Green Energy Biofuel won the award in recognition of its new GEB3 plant. The net supply of renewable diesel to California's fuel market reached 100 million gallons during the second quarter of this year, topping 10 percent of the total diesel supplied to the state in the quarter, according to a report from the U.S. EIA. Reps. Shimkus and Flores released a discussion draft of their 21st Century Transportation Fuels Act Nov. 21.The legislation would reform the RFS through 2022 and provide a pathway to regulations of federal renewable fuels requirements through 2032. The U.S. EPA is extending the comment period on a previously announced information collection request (ICR) that aims to consolidate and update recordkeeping and reporting burden and cost estimates related to the Renewable Fuel Standard program.